The Waldo Canyon fire is currently ravaging the Colorado Springs, CO area. This photo was taken on the evening of June 26th. That day the fire tripled in size. The city of La Vergne has just issued an outdoor burning ban to be effective immediately. This ban covers all open burning and recreational fires, including fire pits, but not charcoal or gas grills. Fireworks are still ok as of posting time, but I urge people to use caution and common sense with their fireworks this summer. 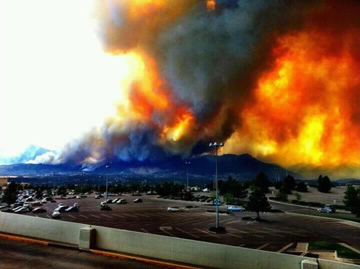 I have a good friend who had to evacuate with her family from their home last night in Colorado Springs, CO, and I can only imagine the stress she must be feeling at the chance that her home will burn to the ground before she returns. I would hate for anyone to have to go through that here. Temperatures are set to climb well over 100 degrees in the next several days, humidity remains lower than usual, and there have already been several wildfires in Eastern TN this month, so we all need to be mindful of this very real threat. Do not light fireworks in any areas where the sparks could ignite dry grass, leaves or other potential fire fuel. Always have an approved fire extinguisher and/or an available water supply to douse sparks or flames. Also wet the area around where fireworks are being discharged. Check with local ordinances and authorities for bans on fireworks and open burning. Wildfires can start when fine, dry fuel, such as grass, comes in contact with catalytic converters. Thinking fireworks should be as well. Too dry and no reason to risk it. *Update- La Vergne fireworks now banned. Celebration in the park will continue, though.